Springsteen's rise to the top of American music coincided with the triumph of American conservatism, and the veneration of marketplace values above democratic principles and humanistic priorities. Springsteen has consistently summoned his creative power and artistic vision to indict these political developments and demand the cultivation of a more compassionate and progressive society. And yet his often harsh critique of the status quo and radical ideas for reform have either been ignored or misunderstood, as a result of his "All American" image and his narrative storytelling style. On nearly ever major issue -- poverty, racism, urban decay, war, and peace -- Springsteen's music has offered a unique vision for moving forward with the agenda of creating 'the country we carry in our hearts' -- as he called it in an op-ed for the New York Times. 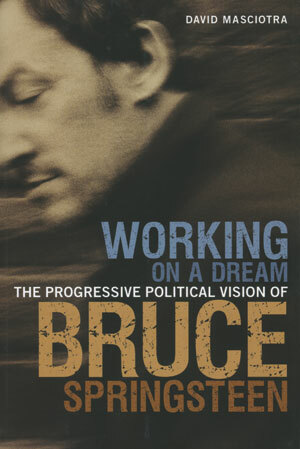 Filled with provocative analysis of Springsteen's best-known hits and his most obscure songs, comparisons to other important works of American culture Ñ ranging from The Sopranos to Edward Hopper Ñ and a wealth of information about the last fifty years of American politics, culture, and society, Working on a Dream is a powerful and engaging study of this songwriter and performer's art. Author David Masciotra has written for Z Magazine, the Catholic Worker, the Humanist, PopMatters, and the Herald News in Joliet, Illinois, where he was a weekly columnist. He is a graduate student at Valparaiso University, and lives in Indiana. From Continuum Books, publishers of the 33-1/3 series. Paperback, 266 pages.